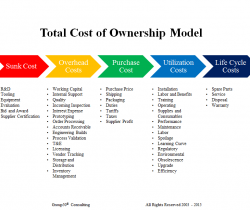 In an earlier blog, we examined why having a process in place to capture Total Cost of Ownership (TCO) is important for middle market companies, and even more so for Digital Technology organizations. We saw how any plan for taking out cost, driving revenue, or maximizing asset utilization, can be fraught with risk, without a holistic view of its underlying costs. The TCO process enforces a discipline for articulating business benefits and impacts in common financial terms. Digital Technology / Information Technology organizations find that the TCO process leads to a stronger alignment and integration with the business. We listed examples of a number of cost contributors to consider when preparing a TCO analysis, and some were apparent while others could easily stay hidden. Today we build on that understanding with some simple ways to make that analysis more effective and ensure its completeness. Acquire – These are things you have to do to buy/lease the product/service and then to get it working. Costs associated with buying or leasing tend to be easily apparent. Getting things working may uncover some hidden aha’s. Run – These include some readily apparent costs such as maintenance contracts, but now hidden costs start making themselves felt more and more. The additional network bandwidth required to temporarily migrate peak workloads to the cloud is one such example. Modify – Your business needs are sure to evolve, and as they do, you will likely have to modify the product or service. What all will that entail and how much will it cost you? Of course the ultimate modification is when you need to retire and perhaps replace the product or service entirely. Can you see how the balance could easily tip over to more hidden costs and fewer apparent ones? A Total Cost of Ownership analysis is much more powerful when it shows a what-if comparison between two or more options. If you are only evaluating one product or service the other option is to use TCO to evaluate it against what you are doing today. This can be done by expanding the utility of a TCO analysis to demonstrate the net impact on cash flow. We often use this approach to understand the cost delta between business as usual and the other options under consideration. Our team of Digital Technology professionals have helped IT organizations integrate the ability to see and communicate the complete business impact of technology products and services. This approach forges strong partnerships between IT, Business and Financial teams in companies ranging from startups to Fortune 50. If you would like to see how Group50’s team of technology, finance, and strategy experts can help you strengthen your company’s Business-IT-Finance partnerships, and how we can implement a Total Cost of Ownership – TCO process in your business, please send an email at info@group50.com. You may also contact the head of our Digital Technology Practice, Shirish Néné at snene@group50.com or call him at 703-201-3936. About the Author: Shirish Néné is the head of Group50’s Digital Technology Practice. Shirish and the Group50 team are a cadre of veteran executives with a track record of melding people, process and technology into game changing strategies and tactical advances across a wide range of industries, ranging from start-ups to Fortune 50 companies. Our experience is reflected in a field-tested methodology and framework for establishing Digital Technology in its natural role of a strategic corporate asset. Our perspective from the trenches to the boardroom has instilled in us a respect for, and ability to fit into a variety of corporate cultures.